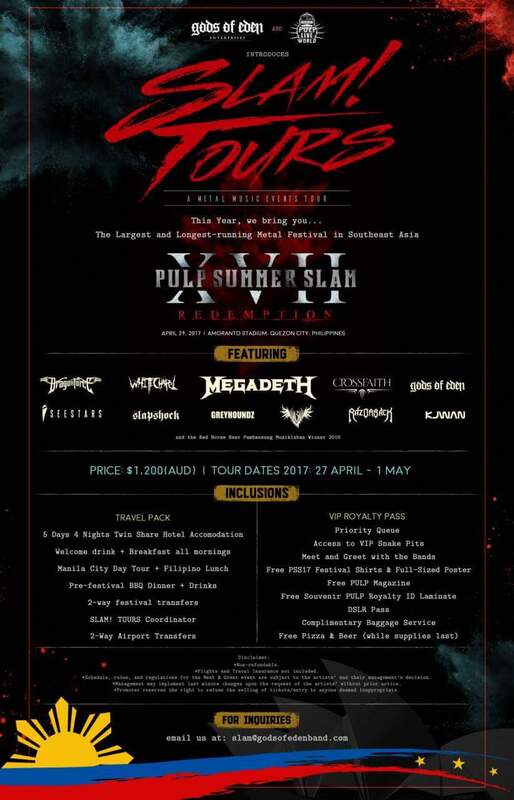 One of Australia’s greatest progressive metal acts, Gods Of Eden have joined forces with the largest and longest running metal festival in South East Asia, Philippines Pulp Summerslam to offer Australian fans a very unique experience! Philippines Pulp Summerslam XVII takes place on Saturday, April 29 in Manila and features an incredible line up including Megadeth, Dragonforce, Whitechapel, Crossfaith and Gods Of Eden. You will be picked up by car from the airport and taken to the hotel for check in at the heart of Quezon City. Wake up to Manila’s sunrise and prepare to explore the vibrant city! Breakfast will be served at the hotel. Meet the tour co-ordinator and be guided over to the old district of Intramuros, the Walled City of the colonial Spanish period. After the amazing city tour, take a breather at the hotel and prepare for pre-festival dinner and drinks! Experience Korean BBQ at Seoul Train! Receive your free festival t-shirt and poster plus a special backstage VIP pass.